Beatrice, from Much Ado About Nothing, is my spirit animal. Shakespeare's heroines give feminists like me pause every now and again (we're looking at you, Kate from Taming of the Shrew) but Beatrice never disappoints us. She's sharp-tongued, quick-witted, bright, and assertive. The number of times she interrupts male characters almost evens the score for any woman who's been subject to mansplaining, and we love her for it. In Much Ado About Nothing, Don Pedro hypothesizes that her strong and merry personality is likely due to special circumstances at her birth. 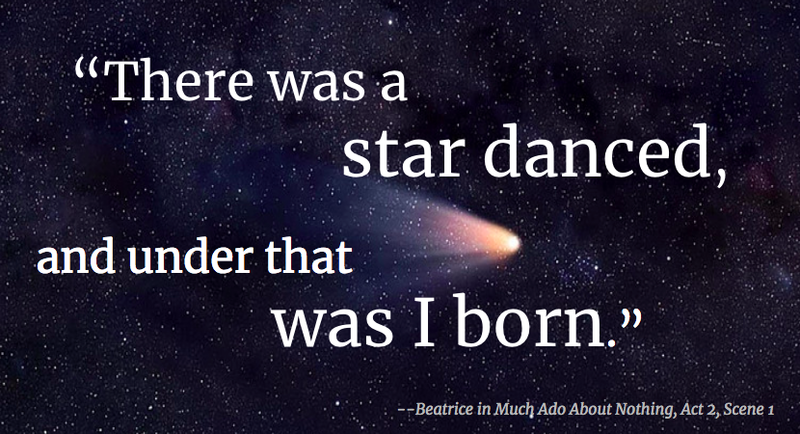 Indeed, she confirms that she was born under a dancing star. I don't think the circumstances of Shakespeare's birth were extraordinary by any means, but the romantic in me does believe that the world today boasts a little more beauty because he once inhabited it. I keep this in mind when I front-load my Shakespeare unit, and most importantly when I introduce Shakespeare (the man, not the works) to my students. I've done this in a few ways over the course of my career, and I've never been satisfied with it until this year. This year, I put aside my lecture notes, my power points, my photos, my video biographies, and my articles. After all, the usual techniques could never adequately introduce a man who was born beneath a dancing star. 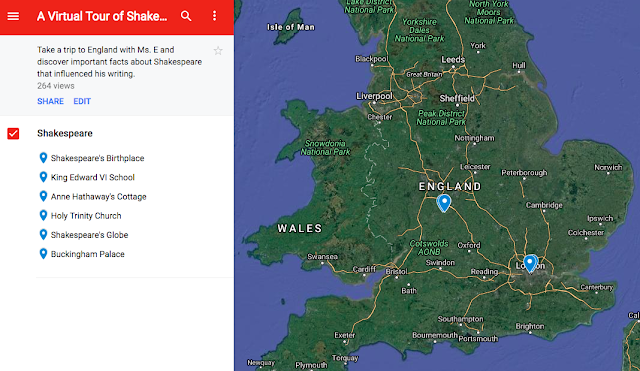 Instead, I turn up the engagement and ignite students' sense of discovery by tossing them headfirst into an interactive Google Map of Shakespeare's old stomping grounds. I made the whole thing myself, and my students loved it. Luckily for me, I had plenty of source material. When I was a 6th grader, I promised myself that I would one day travel to Shakespeare's hometown of Stratford-Upon-Avon to see it for myself. I checked this off my travel bucket list in the summer of 2016, and the trip exceeded every expectation my awkward, daydreaming, 11-year-old self could have possibly imagined. It was a few months ago when I realized that all the photos I took during that trip could actually come in handy in my classroom! Enter: Google Maps. As I was working through my Google Level 1 and 2 Certification, I learned about the features of Google Maps that allow you to design a personalized journey that students can click through at their leisure. 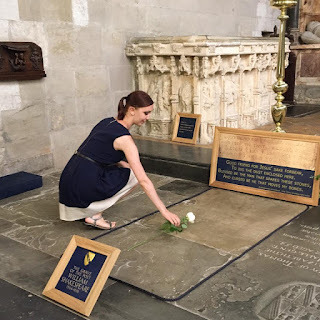 I integrated tons of my vacation photos from England and added my own narrative--essentially taking on the role of the "tour guide" who would take my students across the Atlantic and back in time 400 years. I paired my Google Map adventure with a simple quiz on Google Forms and then I turned my students loose within Shakespeare's world. Students could see a bird's eye view, zoom in to see the streets and businesses that exist there, or even place themselves within the map and "walk around" town by clicking arrows already embedded via Google Maps. They could see as much or as little of each location as they liked. And oh, the things I heard during this activity: "Whoa, is this really the inside of his house?" "How far did he have to walk to get to his wife's cottage?" "Weird, the Globe Theater is completely round!" "Look! I found his grave stone!" "How did he learn Latin when he was so young?" "Did the Queen like the plays he wrote?" Google Maps pushed my students directly into an inquiry-based bubble where they could explore, ask questions, wonder about Shakespeare's life, make hypotheses, and develop a hunger to know more about the Bard. And given how little we actually know about Shakespeare's life, I couldn't think of a more appropriate way to introduce him. Rather than rattling off details--both real and romanticized--about Shakespeare's life that I've collected over the years, I allowed my students to make their own judgments and guesses about who this great man was. Likewise, the "tour guide" narrative I included gave my students the clues they would need to understand what life was like in Elizabethan England and to later uncover how and why characters behave the way they do throughout his works. If you're interested in checking out my Google Map (or even using it in your classroom), click the preview photo below! And if you'd like to pair it with my Google Forms quiz (which grades itself upon completion), you can access and edit it here. What do you think of my introduction to Shakespeare? My ears are always open for feedback. Feel free to share your best practices for introducing the Bard to your students as well. Hi, Amy! I just stumbled across your blog during a search for anything online about Dusky Reider. I brunched with her today and another friend, and was trying to find material to help further explain to my friend what Mrs. Reider did - for me, for you, and for tens of thousands of other students who have been happily spellbound by her and her lessons for years. My experience with her - in 7th grade at Immaculate Conception Elementary School - inspired my professional acting career. I'm not as active now as I was even just a couple of years ago (when I returned to school to study nutrition and dietetics), but every time I perform I do so with an appreciation for the great part Lady Dusky played in my development and my destiny! Best wishes for continued success along your own teaching path! Hello, Emily! Thank you for reading! I am thrilled to hear from another graduate of Lady Dusky's "Shakespeare bootcamp" and even more happy to hear that she is doing well! I find myself likewise tongue-tied when I try to explain the experience she gave us with Shakespeare. Even in my 10th year of teaching with an unyielding desire to improve my instruction every year, I still don't even come close to what she does! She made it all look so simple - how on earth did she do that? It's been wonderful to hear from you! I wish you the best of luck with acting, even as you pursue other adventures as well. Thank you for reaching out!